New research shows that these are the decision-making benchmarks to beat. How does your company stack up? New research reveals the core decision practices that distinguish top performing companies. Is your company under pressure to innovate and compete? These are the benchmarks to beat. These insights are based on studies of a thousand companies and tens of thousands of business decisions. Top companies are already doing it, and yours can, too. 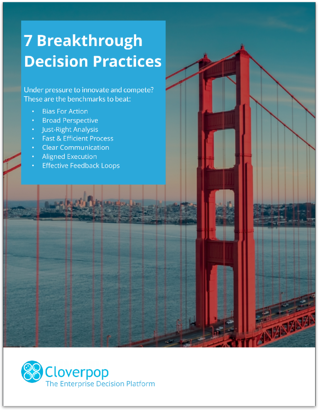 Read this white paper to learn how to apply a radical new approach to decisions at work.